To bring out our clients' brightest colors. We believe in doing what we LOVE and working with people that value what we do. Genesis Marketing takes your colors and brightens them. We have the ability to analyze your color palette and showcase your brightest colors. We adapt to your colors and inspire consumers to fall in love with your brightest colors. We splash your colors worldwide. We bring together our customers' passion for their product and services, brand connections, social and media connections, with a relentless dedication to helping our customers be sustainable and grow. A good website is easy to spot! You know it's GREAT when you see it. With every new site project Genesis Marketing takes on, we aim to help our clients make an impactful first impression. What is it that makes a Genesis Marketing website so darn good? We work to bring your brand to life visually! Web design must showcase your brand identity and tell its story. By unifying your brand design practices across all contact points, a web design becomes part of a cohesive and distinctive user experience for your customers, whether they're online, experiencing your product/service or visiting you in person. As an example, the Beck's Harvest House website does a fantastic job of unifying their design from web, to retail, to the product. Discover Cle Elum successfully translates their local history and unique visitor experience on their website. Modern web design is all about facilitating and emphasizing your content. Our websites are built around the principles of simple, clean and non-intrusive frameworks, which surface as better design output than clunky alternatives. The age of the ‘one-size-fits-all’ approach has long ended. Simple practices include personalizing account settings that allow users to set favorite pages, changing color schemes, controlling customer information, retaining individual preferences and changing dynamically in response to different customers. Great design is about giving each user exactly what they want. With innumerable screen devices, browsers and operating systems available, web and app design can no longer be created along rigid and static dimensions. The effectiveness of web design is now judged on how well it adapts to the devices and platform its target customers use. Allow us to create web experiences that adapt to the technology and platform your users are utilizing. In design terms, we call this ‘usability’. Our websites consider the many different paths customers might take to achieve their goals on your website. By removing friction along these paths, users have a better experience and ultimately convert more often. At Genesis Marketing, our websites anticipate what users need and provide an experience to match. The importance of social media in your current and future digital presence is undeniable. To become truly social, websites and content have to be designed in a way that fit for social consumption digitally. Cramming too much into each page creates confusion. Visitors get frustrated when they have to scan through rows of links and images to find what they are looking for. By keeping your pages simple, your website will be easier to use. When you meet someone for the first time, you want to make a good first impression. The same should be true for your website. The overall look and feel of your site is the first thing your visitors will notice. 3. Navigation should be intuitive. There are few things more frustrating than not being able to find what you want on a website. Pages should be well-organized with a top-down design so that visitors can easily browse through the different sections of your site. Visitors shouldn't feel like they are visiting a new website each time they open a new page on your site. Consistent design across the pages within your site makes navigation a much easier task. Color selection can make or break a website. Most of us have visited websites that are simply painful to look at. When choosing colors, use a consistent palette of colors that don't clash and make sure there is a strong contrast between the text and the background. 6. Make your website responsive. People will access your website using a wide variety of devices – from smartphones to desktop computers. Therefore, it's important that your website displays correctly on different screen sizes. CSS media queries are a great way to implement responsive web design. 7. Develop for multiple browsers. Browsers are supposed to render pages the same way, but they don't. Therefore, make sure to check your website in multiple browsers to make sure everything appears correctly. It's best to catch problems ahead of time instead of relying on complaints from your visitors. 8. Check your website for errors. As any experienced editor will tell you, a great piece of work can be tarnished by a small error. If you're a webmaster, check your websites on a regular basis for typos, broken links, and images that don't load correctly. 9. Write your own code. Genesis Marketing will write custom code for your site. When coded, you have full control over how they look and act. 10. Don't forget the content. Even if your site is beautifully designed, it's only an empty shell without content. A good website has both great design and great content. Therefore, make sure your pages have unique, original content that makes them worth visiting. We are obsessively committed to growing our customers' business. Our strength is to customize our services to perfectly match your needs. We pride ourselves on being “Freaky Flexible” with our core values directly connected to our obsession to be our BEST for our clients. Strategist that optimizes media placement whether traditional or online. Genesis Marketing believes in the science of happiness. We work hard every day to be at our “BEST” through working on being “Heliotropic”. We believe that in acting this way we bring out our best performance, creativity, and our best health. Recently, a critical mass of research has provided what might be the most basic and irrefutable argument in favor of happiness: Happiness and good health go hand-in-hand. Indeed, scientific studies have been finding that happiness can make our hearts healthier, our immune systems stronger, and our lives longer. Several of the studies cited below suggest that happiness causes better health; others suggest only that the two are correlated—perhaps good health causes happiness but not the other way around. Happiness and health may indeed be a virtuous circle, but researchers are still trying to untangle their relationship. We like to think our weekly color emails make people happier...this is our desire and wish for all who receive them. I have been working with the Genesis team since July so I'm a fairly new face around the office! I currently attend Seattle University and will graduate this June (yay!) with a BABA, majoring in Marketing with minors in Psychology and Economics. While I am finishing up with school I will be working remotely for the team from Seattle. I have been helping out with a lot of writing content but will be trying out some design work as well. I grew up in Spokane and attended Ferris High School. I'm a big coffee drinker and cannot function without it. I also love Diet Coke. I enjoy baseball and am a fan of the Washington Nationals. I love to travel! I studied abroad in Florence, Italy last year and had an amazing time. Working with the Genesis team has been a great experience so far and I'm looking forward to learning more from them! That's me in a nutshell, I hope to meet you soon! 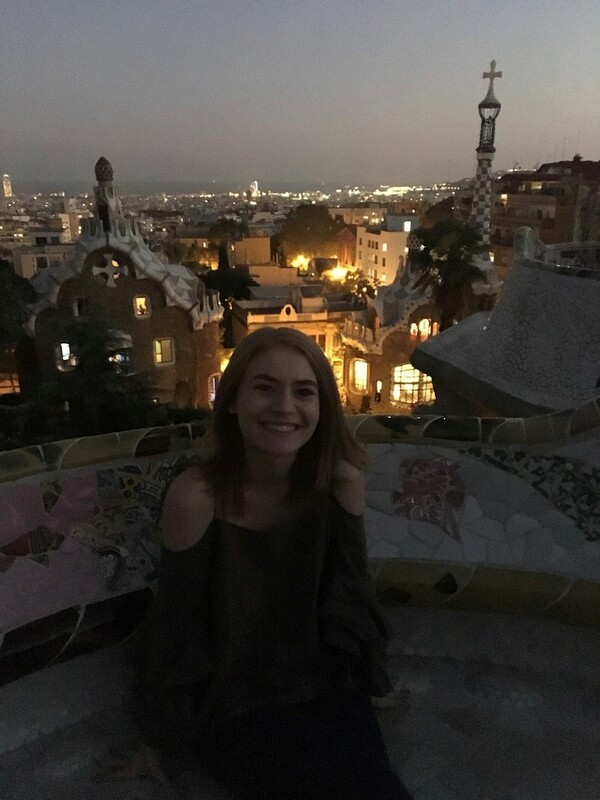 Enjoy this photo of me at Park Guell in Barcelona!